Chemeketa's next leader will succeed president Julie Huckestein, who retires at the end of the school year. 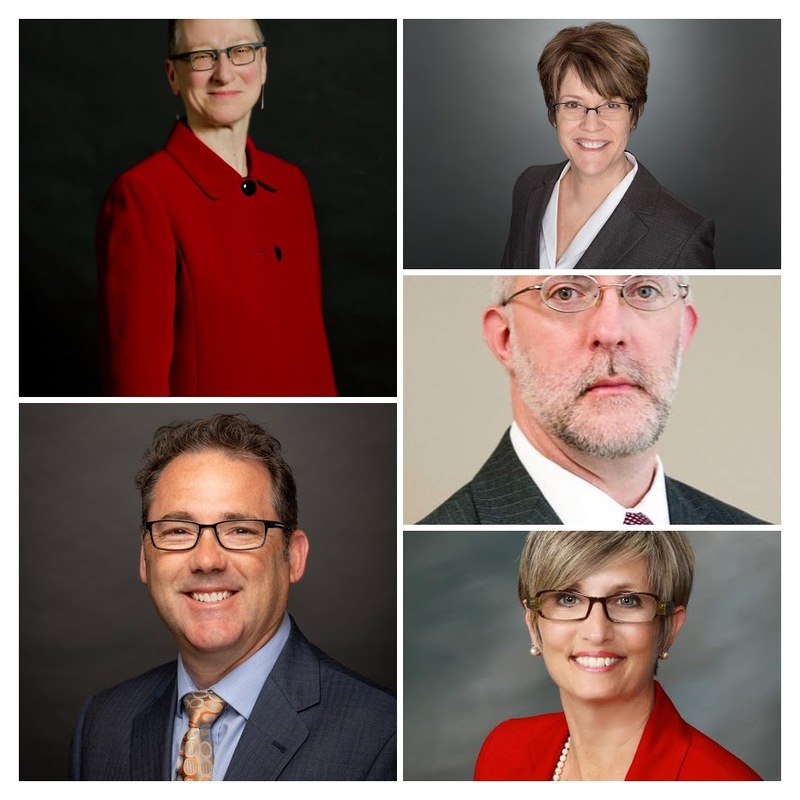 Finalists for Chemeketa Community College president are Julie White (top left), Tod Treat (bottom left), Jessica Howard (top right), Robert Wynegar and Kimberlee Messina. College administrators from five states are vying to replace retiring President Julie Huckestein as the next leader of Chemeketa Community College. Two candidates, Tod Treat and Kimberlee Messina, are also finalists for the president job at Central Oregon Community College in Bend, according to the college’s website. A Chemeketa presidential search committee narrowed down applicants and announced the finalists Wednesday. Forums with the candidates will be held the week of Feb. 25, with specific dates and times to be determined. The college’s next president will oversee a budget of about $85 million and programs for tens of thousands of students across campuses in Salem, McMinville and Woodburn. Huckestein, who has led Chemeketa since 2014, will retire June 30. Jessica Howard, campus president for Portland Community College’s southeast campus since 2012. She leads workforce development operations. Howard was also a finalist for Clackamas Community College president in a job search last year. She has worked as an instructor and administrator at San Antonio College and has degrees in performance studies and music theory. Kimberlee Messina, interim vice president of instruction at Clovis Community College in Clovis, Calif. Messina worked as an administrator at San Mateo County Community College and has a doctorate in educational leadership. She has also been a college Spanish instructor and was a first-generation college student. Tod Treat, interim vice president for instruction at Wenatchee Valley College in Wenatchee, Wash., an agricultural hub with a large Latino population. He was an administrator at Tacoma Community College and Richland Community College, and has an academic background in chemistry. Julie White, senior vice president of student engagement and learning support an Onondaga Community College in Syracuse, N.Y. There, she’s worked on initiatives for student engagement, retention and completion. She also leads a statewide group advocating for policies to help community college students be successful and has published research on the effects of racism on community college students and strategies to reduce sexual assault on college campuses. Robert Wynegar, president of the College of The Albemarle in Elizabeth City, N.C. He’s led the college during a large construction project including a rebuilding of the campus library and performing arts center. He’s also led the creation of new agribusiness and emergency medical services programs.